Sometimes when you’ve been really looking forward to something for many years, finally achieving it can be a bit of a let down. 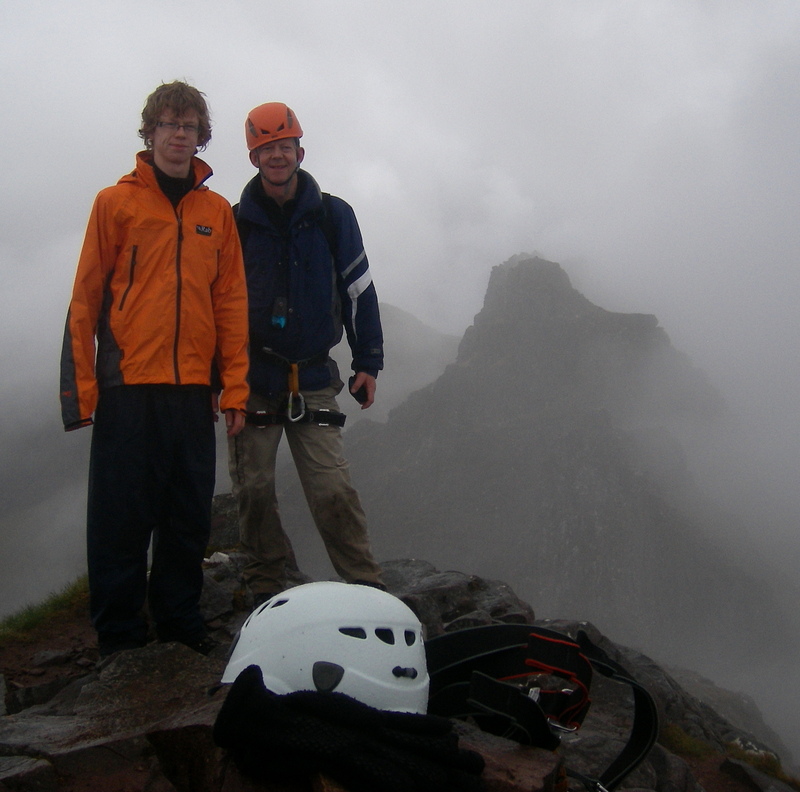 That’s definitely NOT the case with the Aonach Eagach ridge ! One of the (many) pleasures of staying at the Clachaig Inn in Glen Coe, is an evening stroll along the road to the West to look up at the narrow ridge line that is Aonach Eagach. 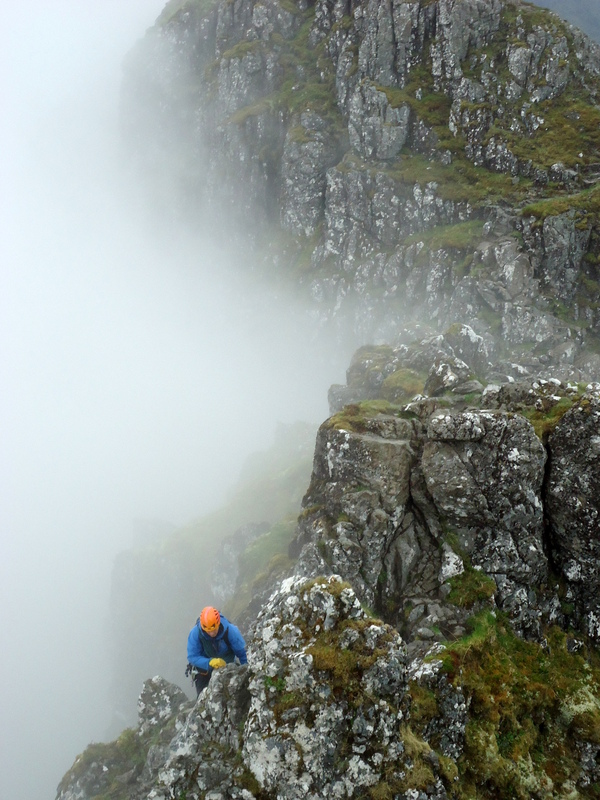 For years this has haunted me : half of me desperate to get up there and test son Sam and myself against Scotland’s ultimate scramble – and half of me thinking of the all too real risks entailed. This year I came up with the solution : call on the services of local mountain guide, Martin McDermott to help keep us on the right track – and more importantly in one piece! To make the day even better, my nephew Lewis managed to get the day off and travelled over from Edinburgh to join us. There’s not really much you can say about the route itself. 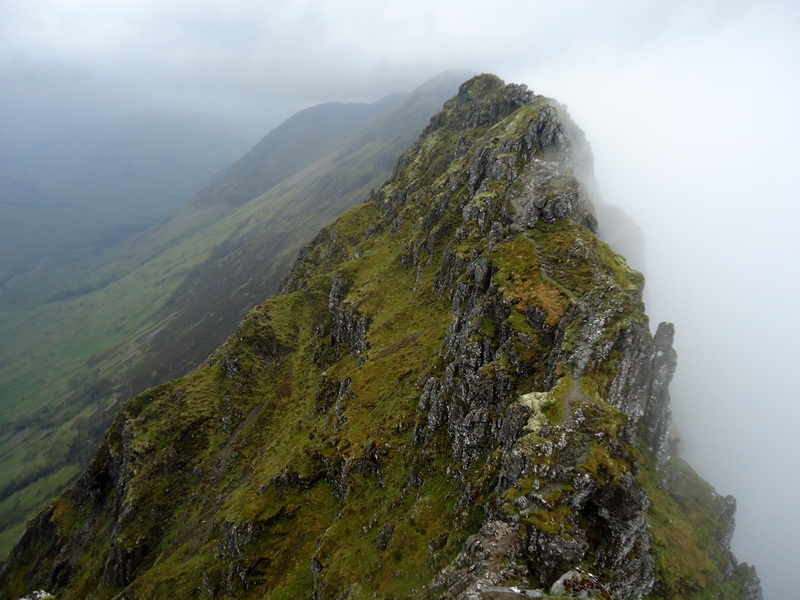 Basically, you drive along Glen Coe for a bit, then climb up a steep track to reach the ridge line at Am Bodach – then follow the crest of the ridge for about 3 miles. 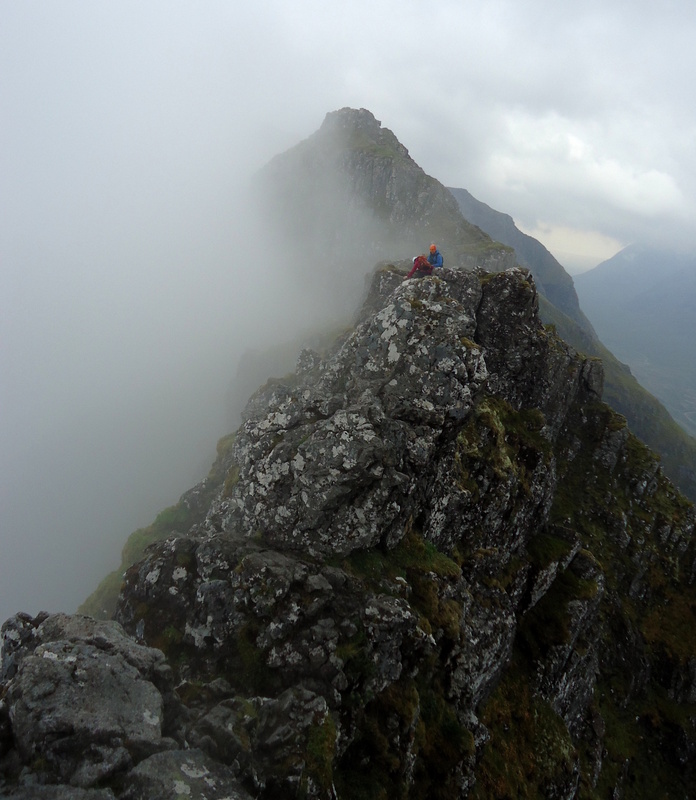 Aonach Eagach is all about the scrambling. Although Martin was fully equipped with climbing gear, it does slow things down significantly. So we agreed to try out the first few sections and see how we all coped. In fact, the climbing itself was fine and although the exposure is severe and some of the moves require careful thinking, there are normally good holds or reachable cracks to jam feet into. The fun starts right away, with quite a steep down-climb near The Chancellor. Like most of the ridge, the problem is not so much the climbing, it is knowing which part of the rock face to attack! There seem to be thousands of route options and some start off OK – only for you to find the degree of difficulty suddenly escalates enormously. Better to back-track and look for the route with the most crampon marks! 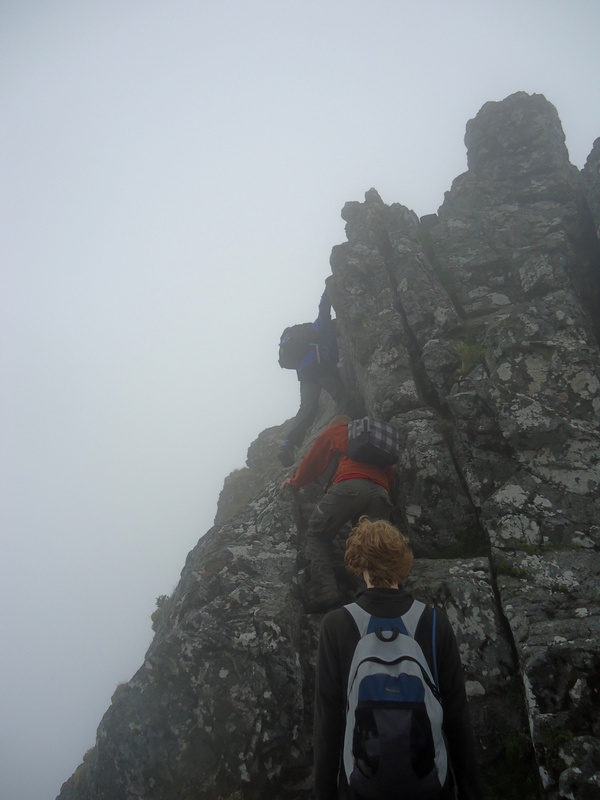 The best section leads from Meall Derrg to Stob Coire Leith , consisting of a line of sharp pinnacles and deeply grooved rock chimneys. After the last Pinnacle, comes the Rock Tower. Again, on first looking it seems impossible to find a safe route up and over this last real obstacle. The easiest way is a narrow chimney crack which veers uncomfortably out to the left – and with a final effort the main scrambling difficulties are over. The rest of the route is ‘just’ an excellent ridge walk, with fine views across Glen Coe and out to the West and plenty of gnarly rock to clamber over. Altogether one of the best ever days I’ve had in the mountains. An unforgetable experience, with just the right level of challenge and exposure – helped along by the excellent company. What better way to end such a perfect day than an evening in the Clachaig bar, reliving some of the day’s (many) hairier moments over a fine venison stew and a pint or two. Oh, and many thanks to Martin (so my wife says) – for getting us all up and down in one piece! 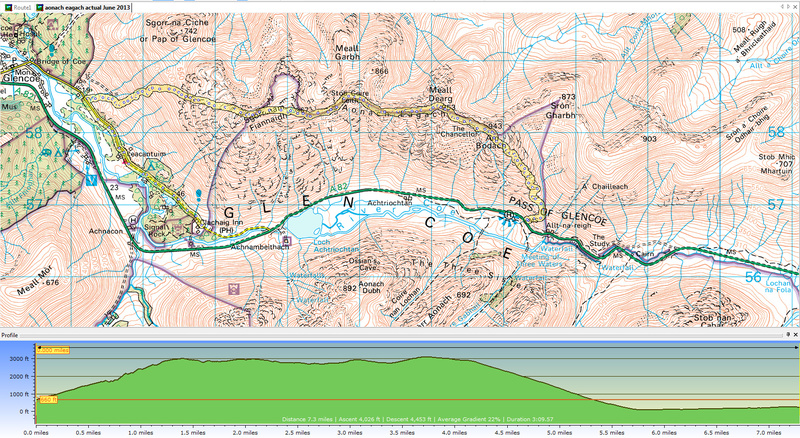 This entry was posted in Glen Coe and tagged Aonach Eagach, Clachaig Inn, Glen Coe, scramble. Bookmark the permalink.